Gidday! And welcome to the first post in my new blog which, as the title indicates, is an excuse to revisit places I've been and enjoy them all over again. Yes, there will be boasting, but I'll try to keep it to a minimum - really I'm just wanting to share. Today I went with my daughters to see the latest Harry Potter movie - The Half-Blood Prince. We're an HP family - in on the phenomenon almost from the start, when my girls were the same age as Harry, and every new book was a huge event for us. I read them all aloud, so we could enjoy them together, and no-one had to wait to find out what happened. It wasn't quite so cosy today, to be honest - as soon as it was over, they were rushing off to re-connect with their own lives, even forgetting to say Thanks for taking us. Teenagers. Sigh. So I don't know what they thought, but I liked it, even though it, like the book, mainly has a filling-in-the-gaps function. There was a lot of good stuff in it, and I was drawn into the story, but the traveller in me was paying attention too: to the dizzying swoop in over London, the destruction of the Millennium Bridge (which I hope to walk over in a couple of months' time), the magnificently bleak Scottish Highlands, the scenes in the cloisters of Gloucester Cathedral, the great hall at Christ Church College, Oxford, the pewter gleam of Loch Shiel below Hogwarts... all places I've been, and some of which I know well. Then I watched a TV documentary tonight about the year of JK Rowling's life when she was finishing HP7, which opened with Edinburgh's sooty skyline, a view I had from my corner room at the Scotsman, just across North Bridge from the Balmoral, where she wrote the ending. 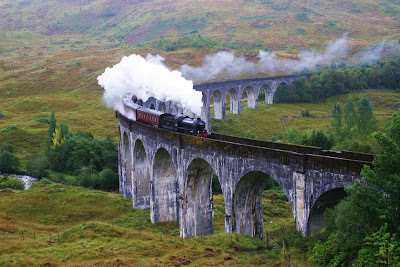 I wrote a story on that trip about HP locations: how I stood on a soggy hillside waiting for the Jacobite train, which doubles as the Hogwarts Express, to come over the Glenfinnan Viaduct; went out on the loch and tried to imagine Hogwarts CGI'd onto a hill; drank a coffee in the Elephant Cafe where JK did a lot of her writing in her impoverished days. But I hadn't realised that I had also visited the location where HP1 was written: the little town of Leith. I went there to look over the Royal Yacht Britannia which is now permanently moored there; and I wandered around the gentrified canal area with its swivel bridge and barges; and took photos of the picturesque Newhaven Harbour where once you could walk from side to side on the fishing boats but where now there's only one lobster boat left amongst all the pleasure craft. JK lived here in a flat which she revisited for the documentary - much nicer than I expected, and tidier than she remembered; but there was a touching moment when she spotted the HP books lined up on a shelf in what had been her bedroom, and it came to her in a rush what a fairytale it all had been. The view from the back room windows is across the narrow and quaintly-named Candlemaker Row into the Greyfriars kirkyard. The soot-streaked tombstones there may have given Rowling some ideas for the spookier parts of her books, but people come here because of another story, that of Greyfriars Bobby. 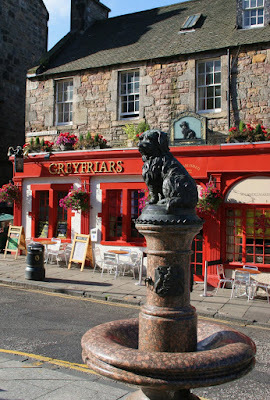 It was here that for 14 years the little Skye terrier called Bobby kept a vigil over the grave of his master, John Gray, leaving the churchyard only for his daily meal when the one o’clock gun boomed from the castle. He died in 1872, having been given the freedom of the city, and was himself buried in the churchyard. There is now an appealing statue of the little dog just down the road from the Elephant House in the street called George IV Bridge. It’s only about four blocks from here along cobbled streets and through tunnel-like alleyways between the tall narrow buildings to where the Balmoral Hotel stands in 5-star splendour under its iconic clock-tower on the corner of Princes Street. For Jo Rowling it must have been an unimaginable journey back in her Elephant House days, but it was here, in the opulence of suite 552 on January 11th 2007 that she wrote the last sentence of the last Harry Potter book. She also, apparently, signed an ornamental bust to that effect, but the management is not interested in encouraging fans to troop inside to view it, and it is tucked discreetly away somewhere. There is nothing, though, to stop anyone from walking past the doorman in his kilt, pushing through the revolving doors and entering the elegant lobby with its chandeliers and thick carpet, to do some imagining of their own. Both Jo Rowling and Harry himself rose from obscurity to enormous fame, and that may not be to everyone’s taste – but aiming to visit the beautiful, fascinating and richly varied country that is Scotland is a dream anyone would be happy to realise. You've been about for over a week now! I am ashamed I didn't know this. Pish! Why would you? I wanted to iron out some wrinkles before I went public.